By the first week of January all devotees who took part in the Srila Prabhupada marathon had returned home to Krishna Valley, and we again held a celebration for them at New Vraja Dhama too. It was a much smaller festival than Budapest though with mainly the local devotees and those from the closer Nama-hattas attending. Since most of those who went out were not full-time book distributors (many nama-hatta devotees could only go out after finishing work or scheduled some of their holidays so that they could take part), thanking them all again for their efforts, they enthusiastically shared their realizations and preaching experiences. After the get together, only the full-time sankirtana devotees continued on with this part of Srila Prabhupada’s mission while the rest returned to their normal services. Then something happened that has never happened before: on the 16th of January Radha-Syama’s temple room closed for almost a month! The artists were renovating the decorative ceiling paintings so the temple room was full of high platformed scaffolding, which meant the morning programs had been continued on in the temple corridor. Unfortunately it meant that Radha-Syama’s altar was closed too, so even we, the local devotees only saw the darshan photos of Their Lordships. There was a projector and screen in front of the temple room doors, so we could see the Divine Couple’s picture which was shown in Their night outfit during mangala arati and Their day outfit at 7am. Devotees were naturally missing Radha-Syama… so during this time period they tried to deepen their relationship with Them in their hearts. 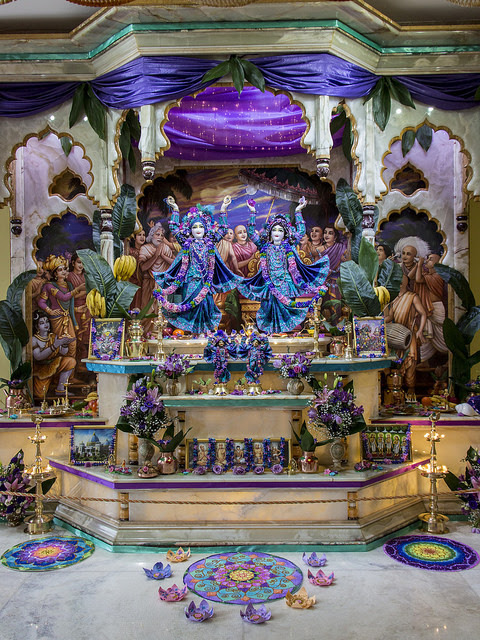 Devotees have not had this experience before since Their installation in 1996. Even when They were moved during the time Their altar was being renovated to another part of the temple, everyone could still see Them and delight in Their beauty at closer quarters. The senior devotees were remembering the time when the temple was being built: Radha-Syama were already here, but They didn’t give darshan to the devotees before Their installation, so everyone could only see Their picture on the temporary altar at that time as well. So devotees were thinking about Them constantly, and offering Them all of their deeds but also finding great difficulty in experiencing the waiting of anticipation for seeing Them placed in Their new temple and altar ready for worshipping. 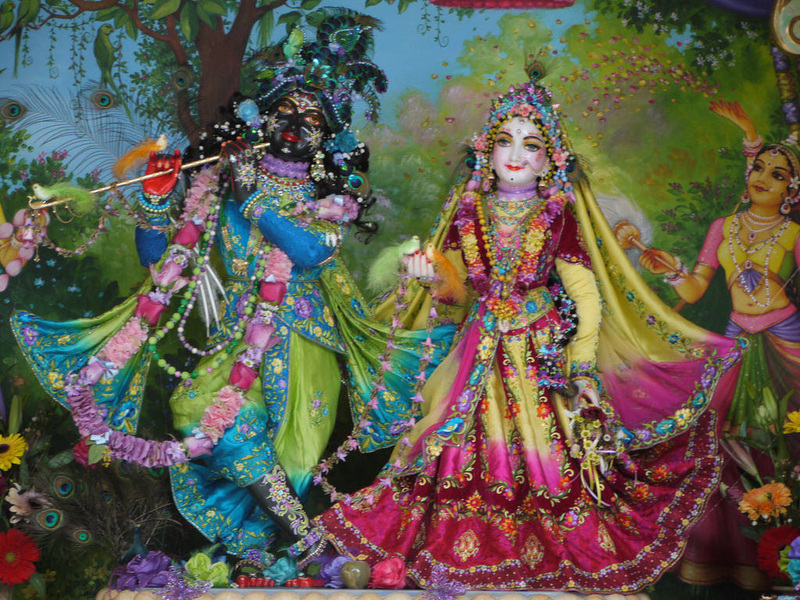 During this month - which eventually turned out to be only three weeks - devotees tried to do more service in the Pujari to gain the opportunity of becoming closer to Radha-Syama, Who – because love is reciprocal – also missed the association of Their servants. Actually yesterday was the first day when we could all gather in the temple room and get Radha-Syama's long anticipated wonderful darshan again. On 21st January we had another festival at the Budapest temple: we celebrated the 25th anniversary of Sri Sri Dayal-Nitai Vijaya-Gauranga! We remembered how the most merciful Lord Caitanya and Lord Nityananda appeared first in Their smaller forms, then a year later in Their large Deity form to bestow Their blessings on to the Hungarian people. We held a rousing kirtana, we remembered the “adventures” of the past 25 years, and besides all this the pujaris thrilled us with wonderful altar decorations, and as well as cooking all day for Their Lordships, an abhishek ceremony was offered too. In January two new full Nitya-seva payments were started and one family began increasing their original Nitya-seva to the usual full amount. Let me share the story of one of the families who just started to sponsor one. Mohan prabhu had approached them a few weeks ago, although all their friends tried to dissuade him by telling him that they were not really in a good financial position at the moment. But because the family had already arranged to see Mohan prabhu he spoke to them anyway and asked if they could maybe take part. They promised to call back in two days after thinking about it with their decision, so when phoning him back they said : “We are not in the best financial situation now, since as you know our business collapsed two years ago. But if we can pay back our debt to the state in two years, which was 6million Huf, then how can we say no to taking on a Nitya-seva for Radhe-Syama and Gaura-Nitai? Surely They will help us manage, as They always have.” So They started payments few days later, and even the two older children gave some donations from their pocket money given by their grandparents at Christmas! We know that many of you make great efforts and undergo austerities so that the future worship of Radha-Syama and Gaura-Nitai will be secured, so we would like to say thank you for all of your hard work and your devotion! The fruit of which is offered at the lotus feet of Their Lordships and the reward is Their eternal blessings. 1st, 2nd, 3rd, 9th, 10th, 13th, from 15th till 17th, 19th, 20th, from 22nd till 24th, 26th and 28th.